U.S. exports set a new monthly record in July of $178 billion, which was an increase of more than 15% from a year ago, and a 3.6% increase from June (see top chart above, full report here). Export categories that showed especially strong gains in July included industrial supplies (+29.3% from a year ago), capital goods (+8.8%), and automotive vehicles (+29.1%), and all three of these manufacturing categories set new monthly records in July. Total trade in July was above $400 billion for only the second time ever, and just shy of the record $401.5 billion total trade in May of this year (see bottom chart above). MP: The record-setting level of exports in July, along with a near-record volume of total trade, suggest that both the U.S. and global economies are continuing to expand, and the robust trade levels do not support a pending double-dip recession. U.S. exports of industrial supplies, capital goods and vehicles, all at record levels in July, indicate an ongoing strength in U.S. manufacturing. over that last 15 years, declines in the US trade deficit have generally coincided with recessions, not booms. it seems counter-intuitive, but it appears that in good times, we import more and that that gets cut back in recessions. increased world trade is not necessarily (though can be) a sign of growth. imagine a 2 country world with GDP 100 and trade of 20.
if gdp dropped to 95 but trade went up to 25 due to more openness, it would give you the wrong signal. i don't have any good data on changes in openness (trade as a % of gdp) worldwide, but i suspect it's been trending up. "over that last 15 years, declines in the US trade deficit have generally coincided with recessions, not booms. it seems counter-intuitive, but it appears that in good times, we import more and that that gets cut back in recessions." We have to look at what was driving imports during the good times. The first decade of the 2000s were defined by a real estate boom and leveraging. The results were ethereal wealth attained to a great extent by home equity loans. What did consumers do with all the loot? They consumed imports. OK, now U.S. consumers are deleveraging, broke or have little discretionary income (ex. luxury market). Where can this economy turn to increase GDP? Consumers with discretionary income in other economies. 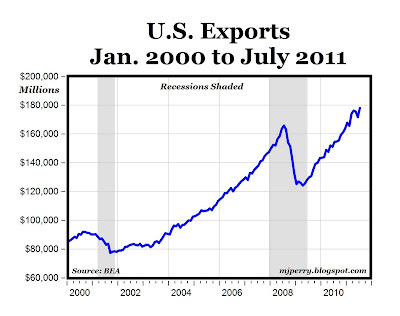 U.S. Exports have been driving most of U.S. GDP growth, that the American economy has had recently. You might also look at the NY Fed model which is still saying there is very little chance of a recession over the next few months. Also, can you comment on the "double dip" frenzy? At what point do you have enough quarters of positive growth before the next recession is just a new recession as opposed to the dreaded "double dip."? Let's hope India and China keep printing money and boosting their economies. The Western economies (including Japan)have central banks decided that pitiful small rates of inflation pose a dire threat. Leadership, and risk-taking, is shifting to the Far East. that fed model is based on interest rate spreads in the bond market. with massive fed distortion of that market, there is no valid signal on which to base it, assuming it worked in the first place, which it didn't. that model (even with a valid signal) missed 50% of recessions since ww2 until we were already into them. 4th qtr GDP will be a Negative number. The first of many. On a "weekly" basis it would have to have been down significantly YOY. Gasoline Demand, this week, went from down 2.1% YOY for the prior four weeks to Down 2.9% YOY in the last four weeks. What happened was: Saudi Arabia, and the oil companies, blew smoke up the politicians, and Wall Streeters' asses by telling them that they could "Ramp Up" production enough to bring oil/gasoline prices back down to levels that would sustain growth. The Retailers, and Manufacturers "bought into" this nonsense, and ordered up a storm. Now, they gots a problem. China and India are employing pro-growth monetary policies. We can be grateful for that. china is building one of the biggest bad debt bubbles in all of history. lending is going up at over twice the rate of growth (which itself is nearly all investment). it's an epic capacity and bad loan bubble. NPL's are going to be off the charts, even if they are not reported. read the back half of brazil's piece from goldman. china is an unsustainable ponzi economy. they are now larger than japan, but have half the personal consumption (and japan's is low to begin with). good luck with your chine fetish bunny. in 5 years, they are toast. In the past when a shrinking trade deficit signaled a recession, both imports and exports dropped, but imports dropped more than exports. 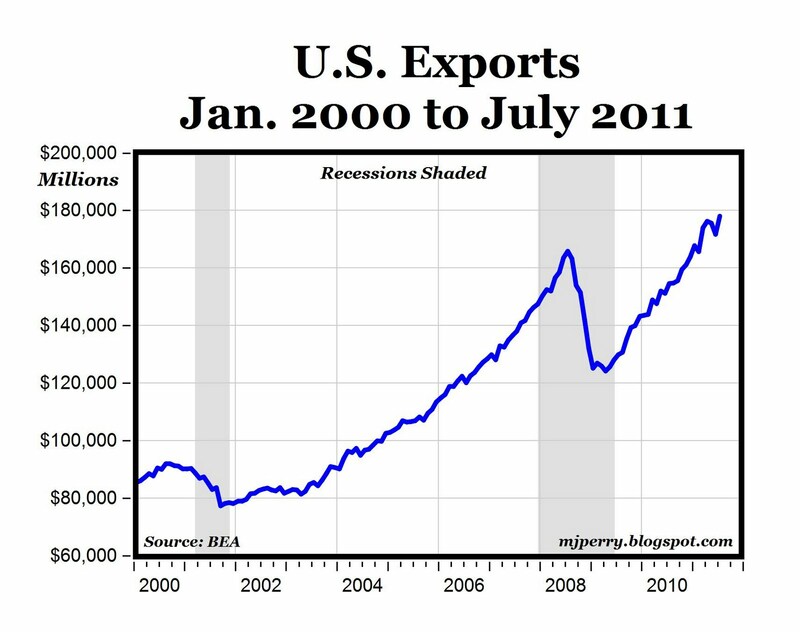 This time, both imports (excluding oil) and exports went up, but exports rose more than imports. Look at the chart at the very bottom of this page. Distillate (diesel) demand has exceeded year-ago levels for the past 5 weeks, after being below year-ago levels for July. This past week it was just *barely* above year-ago levels, but TS Lee probably prevented some trains and trucks from going anywhere the past week. China banks double off-balance sheet loans. Hmm, off-balance sheet loans; Enron and any other entity hiding high financial risk and other shenanigans. morganovich: "declines in the US trade deficit have generally coincided with recessions, not booms. morgqanovich:"increased world trade is not necessarily (though can be) a sign of growth." I suppose one can imagine such a scenario, but that's certainly not supported by empirical evidence. Over the past 60 years, world merchandise exports are highly correlated with changes in global GDP growth. That is, when global GDP growth has slowed, world exports (and, of course, world imports) have declined. When global GDP growth increased, world exports also increased. Buddy: "We have to look at what was driving imports during the good times." Not sure what you are meaning, Buddy. 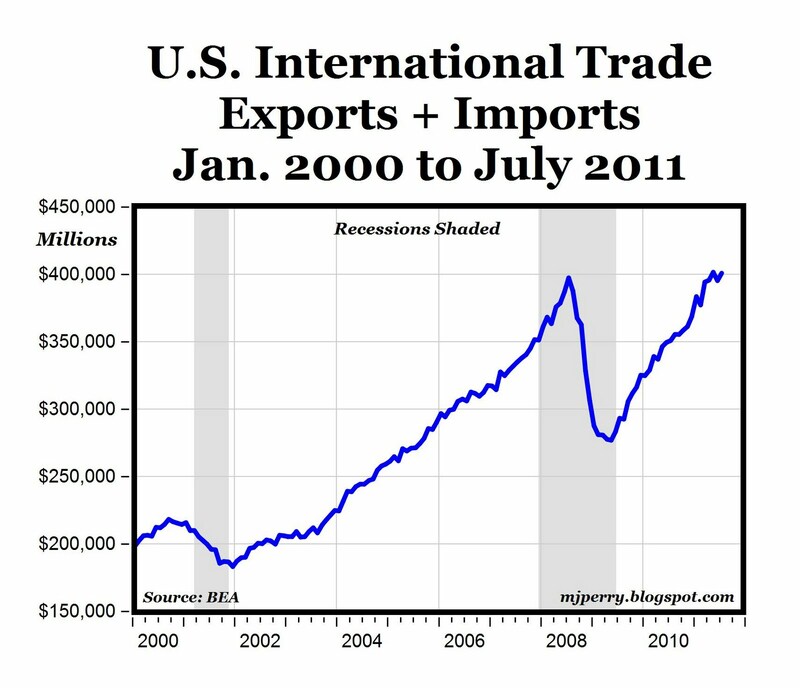 I'm pretty sure that U.S. imports have been growing for six decades. 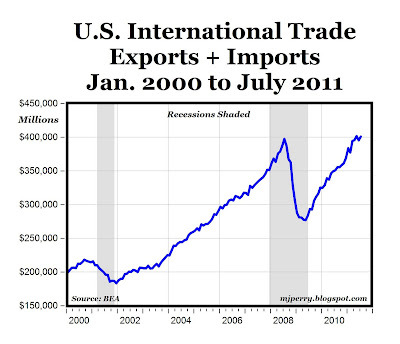 Imports temporarily go down when the U.S. economy contracts, and continue their rise immediately after. The sharp oil price increases of the 1970s masked the GDP-import correlation, but I think it's still a strong correlation.